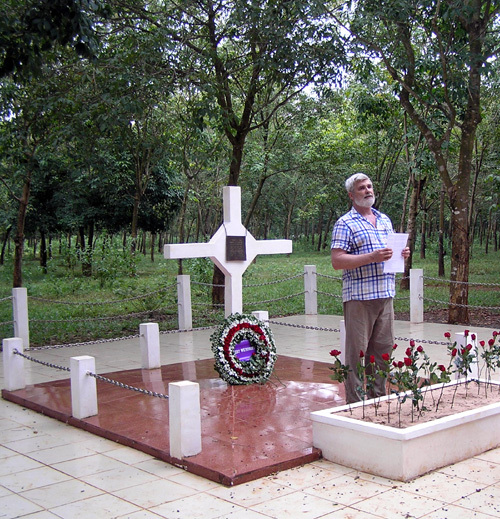 The 2014 Long Tan Trek Tour and the 2014 Decisive Battlefields of Vietnam (DBV) Tour are now finalised. Please see below for a downloadable FLYER and ITINERARY for both Tours. depart VN Wed 29 Oct from the DBV Tour (arrive Aust 30 Oct am). Having listened to those who did the first week only in 2010 and either wanted to see the VC tunnels or wanted some extra time in HCMC (Saigon), we added a day after returning from Vung Tau to do either Cu Chi or see more of Saigon. This worked well for the 2011 Tour, so we are retaining this in 2014. At Cu Chi, you can fire some weapons - AK47, Armalite, M60, etc if you want to (at about US$2 a round but rising every visit!). And again, in response to comments from the 2012 Tour, and by popular request, we'll have a free day in Vung Tau on Thursday 16 Oct. This will allow the Tour folks a day to "do their own thing", whether that be to return to Nui Dat to seek their old unit lines, or go to old areas of operation (if those areas are open for travel), see things not already on the itinerary, or just take some R&C in the town. Maybe catch up with some of the ex-pats? <--- Download the 2014 flyer (1 A4 page). (8 A4 pages, as at 11 Nov 2013). (10 A4 pages, as at 11 Nov 2013). And as you will see from the Tour comments - there's lots to keep the ladies interested - as well as Saigon and Hanoi, there's Ha Long Bay and Hoi An and now a free day in Hanoi. And I might add that they all wanted to see the battlefields as much as the men did.